This article is about man-made stone mounds. For the Australian city, see Cairns. For other uses, see Cairn (disambiguation). "Rock pile" redirects here. For other uses, see rockpile (disambiguation). A cairn is a human-made pile (or stack) of stones. The word cairn comes from the Scottish Gaelic: càrn [ˈkʰaːrˠn̪ˠ] (plural càirn [ˈkʰaːrˠɲ]). Cairns have been and are used for a broad variety of purposes, from prehistoric times to the present. In modern times, cairns are often erected as landmarks, a use they have had since ancient times. However, since prehistory, they have also been built and used as burial monuments; for defense and hunting; for ceremonial purposes, sometimes relating to astronomy; to locate buried items, such as caches of food or objects; and to mark trails, among other purposes. Cairns are used as trail markers in many parts of the world, in uplands, on moorland, on mountaintops, near waterways and on sea cliffs, as well as in barren deserts and tundras. They vary in size from small stone markers to entire artificial hills, and in complexity from loose conical rock piles to delicately balanced sculptures and elaborate feats of megalithic engineering. Cairns may be painted or otherwise decorated, whether for increased visibility or for religious reasons. An ancient example is the inuksuk (plural inuksuit), used by the Inuit, Inupiat, Kalaallit, Yupik, and other peoples of the Arctic region of North America. Inuksuit are found from Alaska to Greenland. This region, above the Arctic Circle, is dominated by the tundra biome and has areas with few natural landmarks. Different types of cairns exist from rough piles of stones to interlocking dry stone round cylinders. The most important cairns commonly used around the world are interlocking stone survey cairns constructed around a central survey mark about every 30 km on the tallest peaks across a nation. These physical survey mark cairn systems are the basis for national survey grids to interconnect individual land survey measurements for entire nations. On occasion these permanent interlocking stone cairns are taken down then reconstructed to re-mark measurements to increase the accuracy of the national survey grid. They can also be used in unpopulated countries as emergency location points. In North America and Northern Europe any type of cairn can be used to mark mountain bike and hiking trail]]s and other cross-country trail blazing, especially in mountain regions at or above the tree line. For example, the extensive trail network maintained by the DNT, the Norwegian Trekking Association, extensively uses cairns in conjunction with T-painted rock faces to mark trails. Other examples of these can be seen in the lava fields of Volcanoes National Park to mark several hikes. Placed at regular intervals, a series of cairns can be used to indicate a path across stony or barren terrain, even across glaciers. Such cairns are often placed at junctions or in places where the trail direction is not obvious. They may also be used to indicate an obscured danger such as a sudden drop, or a noteworthy point such as the summit of a mountain. Most trail cairns are small, usually being a foot or less in height. However, they may be built taller so as to protrude through a layer of snow. Hikers passing by often add a stone, as a small bit of maintenance to counteract the erosive effects of severe weather. North American trail marks are sometimes called "ducks" or "duckies", because they sometimes have a "beak" pointing in the direction of the route. The expression "two rocks do not make a duck" reminds hikers that just one rock resting upon another could be the result of accident or nature rather than intentional trail marking. The building of cairns for recreational purposes along trails, to mark one's personal passage through the area, can result in an overabundance of rock piles. This distracts from cairns used as genuine navigational guides, and also conflicts with the Leave No Trace ethic. This ethic of outdoor practice advocates for leaving the outdoors undisturbed and in its natural condition. Coastal cairns, or "sea marks", are also common in the northern latitudes, especially in the island-strewn waters of Scandinavia and eastern Canada. Often indicated on navigation charts, they may be painted white or lit as beacons for greater visibility offshore. Modern cairns may also be erected for historical or memorial commemoration or simply for decorative or artistic reasons. One example is a series of many cairns marking British soldiers' mass graves at the site of the Battle of Isandlwana, South Africa. Another is the Matthew Flinders Cairn on the side of Arthur's Seat, a small mountain on the shores of Port Phillip Bay, Australia. A large cairn, commonly referred to as "the igloo" by the locals, was built atop a hill next to the I-476 highway in Radnor, Pennsylvania and is a part of a series of large rock sculptures initiated in 1988 to symbolize the township's Welsh heritage and to beautify the visual imagery along the highway. Some are merely places where farmers have collected stones removed from a field. These can be seen in the Catskill Mountains, North America where there is a strong Scottish heritage, and may also represent places where livestock were lost. In locales exhibiting fantastic rock formations, such as the Grand Canyon, tourists often construct simple cairns in reverence of the larger counterparts. By contrast, cairns may have a strong aesthetic purpose, for example in the art of Andy Goldsworthy. Norwegian authorities said in 2015 that illegal cairns are being built each year, to a large degree by tourists to Norway; part of the problem is that individual stones are being removed from registered- and unregistered kulturminner (e.g., historical monuments). The building of cairns for various purposes goes back into prehistory in Eurasia, ranging in size from small rock sculptures to substantial man-made hills of stone (some built on top of larger, natural hills). The latter are often relatively massive Bronze Age or earlier structures which, like kistvaens and dolmens, frequently contain burials; they are comparable to tumuli (kurgans), but of stone construction instead of earthworks. Cairn originally could more broadly refer to various types of hills and natural stone piles, but today is used exclusively of artificial ones. 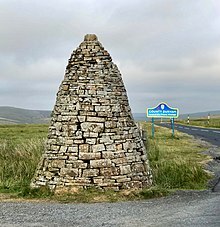 The word cairn derives from Scots cairn (with the same meaning), in turn from Scottish Gaelic càrn, which is essentially the same as the corresponding words in other native Celtic languages of Britain, Ireland and Brittany, including Welsh carn (and carnedd), Breton karn, Irish carn, and Cornish karn or carn. Cornwall (Kernow) itself may actually be named after the cairns that dot its landscape, such as Cornwall's highest point, Brown Willy Summit Cairn, a 5 m (16 ft) high and 24 m (79 ft) diameter mound atop Brown Willy hill in Bodmin Moor, an area with many ancient cairns. Burial cairns and other megaliths are the subject of a variety of legends and folklore throughout Britain and Ireland. In Scotland, it is traditional to carry a stone up from the bottom of a hill to place on a cairn at its top. In such a fashion, cairns would grow ever larger. An old Scottish Gaelic blessing is Cuiridh mi clach air do chàrn, "I'll put a stone on your stone". In Highland folklore it is recounted that before Highland clans fought in a battle, each man would place a stone in a pile. Those who survived the battle returned and removed a stone from the pile. The stones that remained were built into a cairn to honour the dead. Cairns in the region were also put to vital practical use. For example, Dún Aonghasa, an all-stone Iron Age Irish hill fort on Inishmore in the Aran Islands, is still surrounded by small cairns and strategically placed jutting rocks, used collectively as an alternative to defensive earthworks because of the karst landscape's lack of soil. The Riksrösen divide Norway and Sweden. In Scandinavia, cairns have been used for centuries as trail and sea marks, among other purposes. In Iceland, cairns were often used as markers along the numerous single-file roads or paths that crisscrossed the island; many of these ancient cairns are still standing, although the paths have disappeared. In Norse Greenland, cairns were used as a hunting implement, a game-driving "lane", used to direct reindeer towards a game jump. In the mythology of ancient Greece, cairns were associated with Hermes, the god of overland travel. According to one legend, Hermes was put on trial by Hera for slaying her favorite servant, the monster Argus. All of the other gods acted as a jury, and as a way of declaring their verdict they were given pebbles, and told to throw them at whichever person they deemed to be in the right, Hermes or Hera. Hermes argued so skillfully that he ended up buried under a heap of pebbles, and this was the first cairn. In Croatia, in areas of ancient Dalmatia, such as Herzegovina and the Krajina, they are known as gromila. In Portugal a cairn is called a moledro. In a legend the moledros are enchanted soldiers, and if one stone is taken from the pile and put under a pillow, in the morning a soldier will appear for a brief moment, then will change back to a stone and magically return to the pile. The cairns that mark the place where someone died or cover the graves alongside the roads where in the past people were buried are called Fiéis de Deus. The same name given to the stones was given to the dead whose identity was unknown. The Fieis de Deus or Fes de Deus are, in the Galician legends, spirits of the night. The word "Fes" or "Fieis" is thought to mean fairy, the same root as "fate" (fado), that can take the same meaning as the proto-Celtic *bato-, meaning "death". Cairns (taalo) are a common feature at El Ayo, Haylan, Qa’ableh, Qombo'ul, Heis, Salweyn and Macajilayn, among other places. Northern Somalia in general is home to a lot of such historical settlements and archaeological sites wherein are found numerous ancient ruins and buildings, many of obscure origins. However, many of these old structures have yet to be properly explored, a process which would help shed further light on local history and facilitate their preservation for posterity. Since Neolithic times, the climate of North Africa has become drier. A reminder of the desertification of the area is provided by megalithic remains, which occur in a great variety of forms and in vast numbers in presently arid and uninhabitable wastelands: cairns (kerkour), dolmens and circles like Stonehenge, underground cells excavated in rock, barrows topped with huge slabs, and step pyramid-like mounds. Starting in the Bronze Age,[clarification needed] burial cists were sometimes interred into cairns, which would be situated in conspicuous positions, often on the skyline above the village of the deceased. The stones may have been thought to deter grave robbers and scavengers. A more sinister explanation is that they were to stop the dead from rising. There remains a Jewish tradition of placing small stones on a person's grave as a token of respect, though this is generally to relate the longevity of stone to the eternal nature of the soul and is not usually done in a cairn fashion. Stupas in India and Tibet probably started out in a similar fashion, although they now generally contain the ashes of a Buddhist saint or lama. A traditional and often decorated, heap-formed cairn called an ovoo is made in Mongolia. It primarily serves religious purposes, and finds use in both Tengriist and Buddhist ceremonies. In South Korea cairns are quite prevalent, often found along roadsides and trails, up on mountain peaks, and adjacent to Buddhist temples. Hikers frequently add stones to existing cairns trying to get just one more on top of the pile, to bring good luck. This tradition has its roots in the worship of San-shin, or Mountain Spirit, so often still revered in Korean culture. Throughout what today are the continental United States and Canada, cairns still mark indigenous peoples' game-driving "lanes" leading to buffalo jumps, some of which may date to 12,000 years ago. Natives of arctic North America (i.e. northern Canada, Alaska and indigenous Greenland) have built carefully constructed cairns and stone sculptures, called by names such as inuksuit and inunnguat, as landmarks and directional markers since before contact with Europeans. They are iconic of the region (an inuksuk even features on the flag of the Canadian far-northeastern territory, Nunavut), and are increasingly used as a symbol of Canadian national identity. In North America, cairns are often petroforms in the shapes of turtles or other animals. Cairns have been used since pre-Columbian times throughout what is now Latin America to mark trails. Even today, in the Andes of South America, the Quechuan peoples use cairns as religious shrines to the indigenous Inca goddess Pachamama. This is often part of a syncretic form of Roman Catholicism. Although the practice is not common in English, cairns are sometimes referred to by their anthropomorphic qualities. In German and Dutch, a cairn is known as steinmann and steenman respectively, meaning literally "stone man". A form of the Inuit inuksuk is also meant to represent a human figure, and is called an inunguak ("imitation of a person"). In Italy, especially the Italian Alps, a cairn is an ometto, or a "small man". Coastal cairns called sea marks are also common in the northern latitudes, and are placed along shores and on islands and islets. Usually painted white for improved offshore visibility, they serve as navigation aids. In Sweden they are called kummel, in Norway varde, and are indicated in navigation charts and maintained as part of the nautical marking system. Inversely, they are used on land as sea cliff warnings in rugged and hilly terrain in the foggy Faroe Islands. In the Canadian Maritimes, cairns have been used as beacons like small lighthouses to guide boats, as depicted in the novel The Shipping News. This article incorporates text from a publication now in the public domain: Chisholm, Hugh, ed. (1911). "Cairn" . Encyclopædia Britannica (11th ed.). Cambridge University Press. ^ "Backcountry Hikes - Hawai'i Volcanoes National Park". Nps.gov. 2012-04-26. Retrieved 2012-05-25. ^ Radnor Township website Archived 2007-08-20 at the Wayback Machine, Gateway Enhancement Strategy. ^ A Genética e a Teoria da Continuidade Paleolítica aplicada à Lenda da Fundação de Portugal e Escócia Apenas Livros (PDF) (in Portuguese). 2008. ISBN 978-989-618-180-2. ^ Diccionario da lingua portugueza:recopilado dos vocabularios impressos até agora, e nesta segunda edição novamente emendado, e muito accrescentado, Volume 2. pg 31. Books.google.co.uk. 1813. Retrieved 2013-05-30. ^ Dicionario de Dicionarios. Corpus lexicográfico da lingua galega. Dicionario de Dicionarios. "Entienden por éstos o estas fes los espíritus nocturnos, fantasmas, espectros, etc. Acaso serán lo mismo que las fees en francés, y todo de fata." Retrieved January 26, 2014. ^ "Proto-Celtic―English" (PDF). Retrieved 2013-05-30. ^ Michael Hodd, East African Handbook, (Trade & Travel Publications: 1994), p.640. ^ Mason, David (1999). Spirit of the Mountains - Korea's San-Shin and Traditions of Mountain Worship. Seoul, South Korea and Elizabeth, New Jersey: Hollym International Corp. p. 41. ISBN 1-56591-107-5. ^ "Legend (INT Symbology)". Merenkulku.fi. Helsinki: Finnish Transport Agency and Finnish Transport Safety Agency (TraFi). Archived from the original (PDF) on 2012-01-26. Three-language key to reading Finnish navigation charts. Wikimedia Commons has media related to Cairns (rock stack landmarks). Wikisource has the text of the 1911 Encyclopædia Britannica article Cairn. Look up cairn in Wiktionary, the free dictionary. Notes on Building a Cairn (pdf), by Dave Goulder for the DSWA, Dry Stone Walling Association of Great Britain. Practical notes to help those embarking on a cairn-building project. Stop the rock-stacking, High Country News' Writers on the Range opinion-editorial article, by Robyn Martin, suggesting folks stop building "ego cairns." This page was last edited on 14 April 2019, at 05:42 (UTC).